At the outbreak of the war, the Monk family was running the brewery at Kingsland which had been started in 1880’s by Arthur’s grandparents William and Mary. Arthur’s uncle Ernest continued the business but his parents George and Kate moved to Hertfordshire where George took a job as coachman at Wellbury House near Offley. Arthur Henry Monk was born there in 1892 and was one of nine children. His mother died in 1901, so George moved back to Newdigate with his three youngest children, Arthur, George and Kate, and moved in with Ernest at the brewery. Arthur worked as a gardener and became a very keen bell-ringer. He was a very popular young man and was one of the first to join up with his friend Jack Burberry. 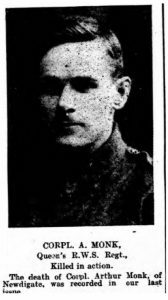 His brother, Albert Ernest, had been a regular with the Royal Garrison Artillery since 1906 and was posted on the 5th August 1914. 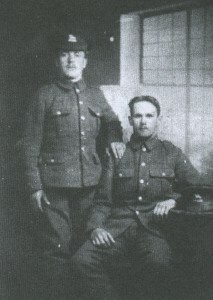 He was discharged on the 12th October as no longer physically fit for war service as he was suffering from myalgia. In the meantime, Arthur was posted to the 7th Battalion, The Queen’s, and after a brief period of training he went to France on the 14th December 1914. 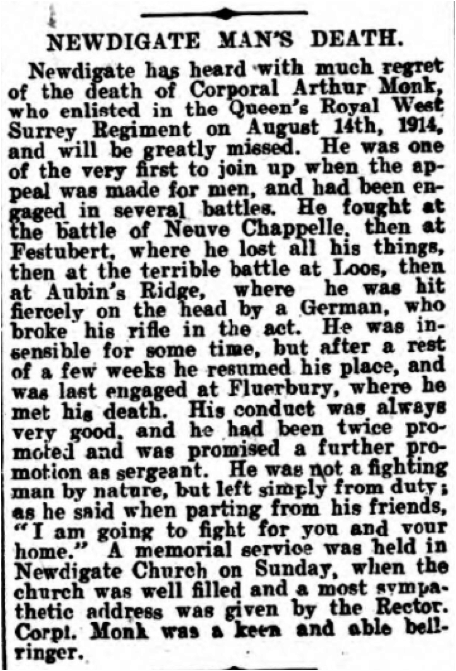 He was in the struggles at Neuve Chappelle, Festubert, Loos and at Auber’s Ridge, and took part in some of the most desperate battles of the was. 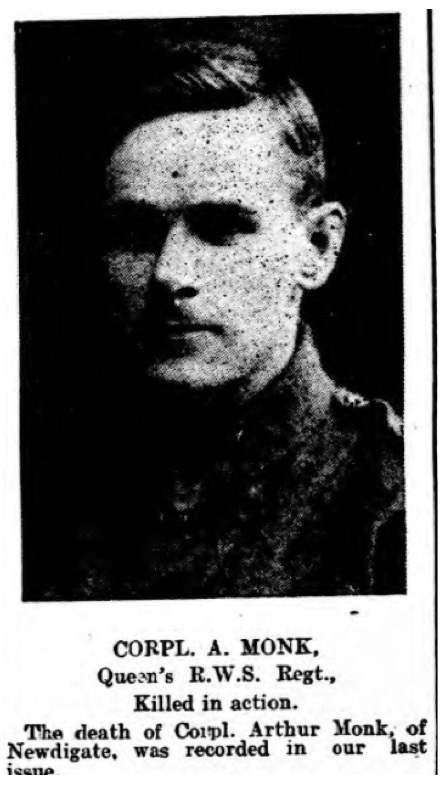 He may have witnessed the deaths of some of his fellow villagers, Stephen Harber and John Kempshall, in July 1916. But still the war carried on and again and another attack was planned, this time the 7th was directed to attack the Schwaben Redoubt. There was continuous fighting at close quarters on the 28th and 29th September, and this continued until the 5th October when most of the Schwaben Redoubt was captured. Arthur Monk did not witness this success, as he died on the 30th September as a result of his wounds. He was buried at the Contay British Cemetery, which was the chosen site for burials of casualties from the 49th Casualty Clearing Station.